It has been sighted 42,000 times in 68 countries, a vicious creature of myth and legend called Sasquatch, Yeti, and perhaps most infamously, Bigfoot. It's been hunted it for years. But what happens when it decides to hunt us? After recovering from a horrific accident, paraplegic Preston Rogers moves back into the remote cabin where he and his now-deceased wife once lived. When his new neighbor Karen, is attacked by a gigantic creature, Rogers contacts the local authorities. But after the police and those around him dismiss Rogers as a delusional widower, he sets out to stop the abominable creature himself. Featuring an all-star cast that includes Matt McCoy (L.A. Confidential, HBO's "Silicon Valley") Jeffrey Combs (Re-Animator, The Frighteners), Paul Gleason (The Breakfast Club, Die Hard), Rex Linn (Django Unchained, A Million Ways To Die in the West), Haley Joel (Tony 'n' Tina's Wedding), Phil Morris ("Seinfeld", Black Dynamite), Dee Wallace Stone (E.T., Cujo), Tiffany Shepis (Tales of Halloween, Victor Crowley) and Lance Henriksen (Aliens, Hard Target)in this wild and gruesome throwback horror shocker that Fangoria called "the best serious fright film ever made about Bigfoot!" 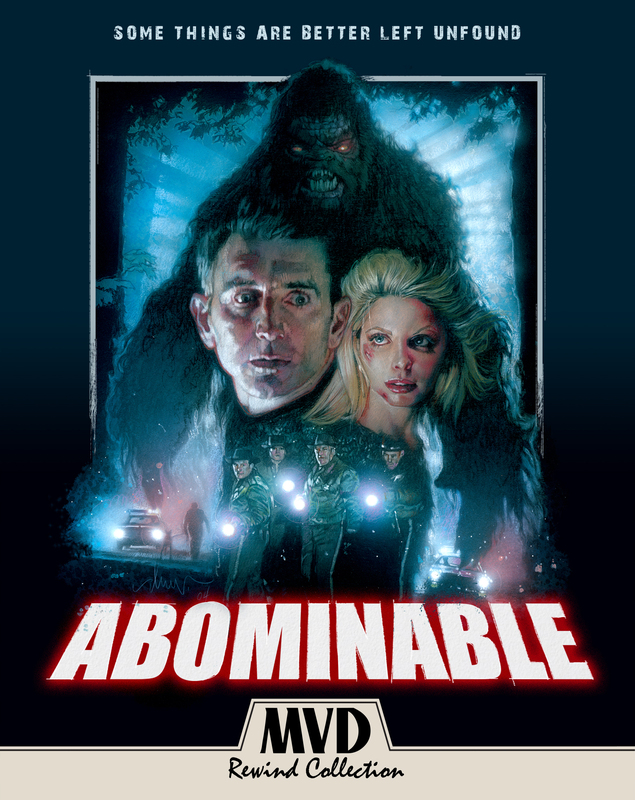 Originally shot on 35mm, Abominable makes it HD debut featuring a brand new high definition transfer from the original camera negative and an ALL-NEW cut of the film with improved CGI-effects overseen by Director Ryan Schifrin and Editor Chris Conlee with enhanced color timing and correction and in this fully loaded collector's edition set! ALL-NEW cut of the film with improved CGI-effects overseen by Director Ryan Schifrin and Editor Chris Conlee with enhanced color timing and correction and in this fully loaded collector’s edition set! First time available on HD Blu-ray with a brand new high definition transfer from the original camera negative! Not only are slasher/horror/splatter films enjoying a sharp spike in popularity, right now they're also where one can find the best comedy. Abominable is a rip-roaring monster movie, and it doesn't try to be anything else. An entirely familiar yet slyly entertaining little throwback to the days of Grizzly, Pumpkinhead, and Prophecy -- with a big dose of Rear Window tossed in, just to amp the tension up a little. Schifrin's modest thriller delivers some gross-out gore in the last third, but spends most of its running time building up a tidy atmosphere of mounting dread.